When you're looking for a mesh network, you want something that works well all the time and that doesn't take a Master's degree in computer engineering to figure out. With Google Wifi, the company got it completely right. Focussing on an unobtrusive design with intelligent technology and an easy app makes it a fantastic product. The only downside if you have a large home is that you'll need to spend money to make it worthwhile. Having spent some time over the pond in the US market, Google's smart home networking system has now landed in the UK. It's not the only Wi-Fi-extending product of its kind available (and there are lesser alternatives, like powerline extenders), but it's comfortably one of the easiest and most efficient ways to create a network that's consistently strong and easily accessible throughout your home. 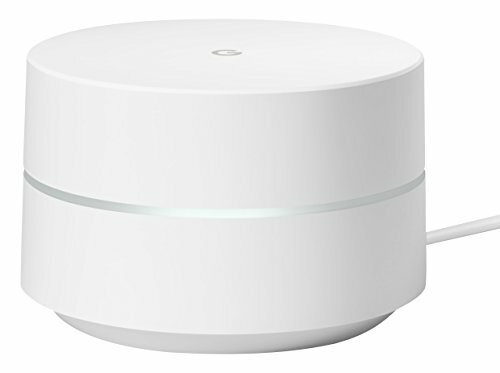 If you've got Wi-Fi weak spots and want to extend your router's internet reach then Google Wifi really is a neat, non-geeky and elegant-looking solution. Before simple mesh networking became a reality, creating a whole-house wireless network would often be a chore. Setting up routers to act as repeaters of your existing Wi-Fi required knowledge and patience. It's also boring as hell. With Google Wifi it couldn't be much simpler. The first step is downloading the Google Wifi iPhone or Android app from their respective app stores, then going through the step-by-step process. Hardware-wise, it's as easy as plugging in the power supply, then connecting the Wifi to your modem using the included Ethernet cable. Once you've done that, the app will then tell you that it's found your new router, and lead you to create a password for it before asking if you want to add another Wifi unit to the network. If you choose to add another Wifi to create the mesh network - and Google sells them in pairs, which is where Wifi's major strength lies - all you then have to do is plug in the second unit into a power outlet in another room (preferably no more than two rooms away from the main unit). Once that is powered up you use the app to tell it to connect wirelessly to the first unit, and it'll take care of the rest itself. As soon as it's setup, the app performs a test to ensure that the connection between the two units is strong enough and that the mesh network is working. Ours was up and running first time, with no issues whatsoever. The entire process of unboxing, plugging in, setting up and adding a second unit took no more than 10 minutes. It's incredibly user friendly. The only frustrating part of setup was entirely down to the non-simple process of reconnecting our smart home products to a new router. Unlike some all-powerful beastly antenna-laden routers from the likes of Asus, D-Link and Netgear, the Google Wifi system is designed to be as inoffensive as possible, without being too dull on the eyes. The units are completely round, with a slim band around the middle playing home to a white LED. They're simplistic, and fill fit pretty much anywhere in a house without looking out of place. That means the antennas are all internal. For those planning on having one in the bedroom, rest assured, you can change the LED brightness, or switch it off completely, so it won't keep you up at night. On the underside, recessed into the base, is where you'll find the collection of ports. Sadly, there aren't many here. There's a Type-C port for power and two Ethernet ports; one for connecting it to the modem, and the other for connecting other peripherals to that Wifi point. There are no USB ports for attaching hard drives and the like. This is internet only - but that also helps to keep it simple. If that's a major concern, there are solutions, like using a quality Ethernet splitter. You can pick those up relatively cheaply on Amazon UK. As well as making setup a breeze, the Google Wifi app also makes managing your mesh network control almost stupidly simple. The app comprises three main screens. The first is a Google Now-like card system which shows snippets of important information. It tells you the current condition of the network, the last speed test results and any software of firmware updates that have been installed. The second screen shows you an overview of the network, including whether the internet is connected, how many Wifi products are online and how many devices you have using the network. Tapping on the first will show you the current usage and a breakdown of automatic speed test results from the past few days. Tapping on the second shows the strength of the mesh network, while tapping on the devices lets you see which gadgets you have connected to the network. You can also set a priority device, based on which you use the most. The last screen is your portal to all settings and shortcuts. In the shortcuts section you can do a quick speed test, set a priority device and show your password. Other options become available when you activate other features like Family Wi-Fi. Family Wi-Fi is an interesting new feature, particularly for parents wanting to restrict their kids' online time. Essentially, you can pause the internet at specific times (like bedtimes) or pause specific devices within a group. For instance, if your kids all have smartphones or tablets, you could tell Google Wifi to pause their access to the internet from a specific time by just tapping a button onscreen - right on your phone through the app. Just go through the Family Wi-Fi setup process, add specific devices to a group (or groups), which avoids other devices (like yours) being affected by any restrictions. "We do the hard work, so you don't have to," is what Google claims on its Wifi product page. In our experience, that's exactly how it's been. We've had two Wifi systems installed and tested (one a review sample, the other purchased). One with two units (£229) in a large-ish bungalow, the other with four units (£458) in a two-storey house with an outside office. In both cases, the consistency of the network in both strength and speed has been brilliant - including reach across the garden. The performance is down to various bits of technology Google has utilised to make it one of the most hassle-free mesh networks around. Using what it calls Network Assist, your phone, tablet, laptop or other gadget will always be connected to your closest point. If you move from one room to another, you'll invisibly switch to the next router that's closest. As far as your device is concerned, it's still connected to the same network. Network Assist also ensures that your device is connected to the least congested channel to make sure that you keep a speedy connection, even when multiple devices are connected. What's more, it also automatically switches between the two available frequency bands (2.4GHz and 5GHz) depending on how far you are from your nearest Wifi point, to ensure you have the best connection. We did multiple speed tests and found that regardless of which Wifi point we were connected to in the mesh network, speeds were consistent across the range. It was as fast in the bathroom (one room away from a second Wifi) as it was in the lounge right next to the central point. The other main benefit of this over using a solution like powerline extenders is that it doesn't drain your phone battery as quickly, since your phone isn't constantly searching and linking to a new source of internet. If you're looking to patch-up Wi-Fi weak spots or extend the reach of your internet around the home, then a mesh network solution such as using multiple Google Wifi units is a great way of doing it. It's hassle-free, you don't need a Master's degree in computer engineering to figure it all out. Plus Wifi looks good, wherever it's sat, which is a rare thing for connectivity products indeed. It's unobtrusive design and easy-to-use app makes it a fantastic product. The only downside if you have a large home is that you'll need to spend money to make it worthwhile. A single Wifi unit costs £129, a twin pack is £229. If you want three of them, that'll mean buying a single unit plus the twin-pack (£358). There is a three-pack you can buy from Amazon, but it's more expensive. Although it's not cheap, we think it's worth it as the convenience and benefits are worth the outlay. You might cringe at initially handing over the money, but once it's Google Wifi is up and running, and you have a solid Wi-Fi network throughout the home, you'll forget that rather quickly.